Brasserie Bread ‘ The art of Sourdough class’ and the ‘Pancake Files’ continue..
Bianca: We have vast interests and hobbies here at FFS. Ness and I particularly love cooking and baking and while that has taken the back seat of late due to a little bubbalah and work and social commitments. We always look forward to getting into the kitchen and tackling something new or something tried and tested. Bread has always been something that frightens me, anything that involves yeast just adds a whole other element of scary. We were invited to The Art of Sourdough baking class at Brasserie Bread’s Banksmeadow factory. But we thought we’d get some fuel into the belly before we began. Ness always a sucker for a good croissant went with the Warm Ham & Cheese Croissant $8, a classic for a reason. Decadent and comforting. Alex was drawn to the Avocado Toast w/baked cherry tomatoes $12 you’re usual standard. A great choice to highlight the quality of the bread. And finally, saving the best for last. My Sourdough Pancakes -w/ berries & honeycomb cream $16. Very light and fluffy, loved the fresh berries and the honeycomb cream. But these aren’t your guilt-inducing pancakes as they were not overly sweet. Having been fed and watered we headed into the Breaducation ‘classroom’. Throughout the 4 hour class (we ran over 1 hour, as the teacher got a little carried away with the stories) we learnt how to make a Pain Blanc from scratch. Including the correct mixing and kneading techniques. Despite his messy hands, even Alex looked like he was enjoying himself. Then using a dough provided by Brasserie Bread, we shaped Baguettes, Knot Rolls, Round Rolls, an Epi and the Schiacciata. But perhaps the one weapon everyone should have in their bread repertoire/ arsenal. Is the mindblowing Schiacciata con l’uva (Foccacia w/ Grapes). 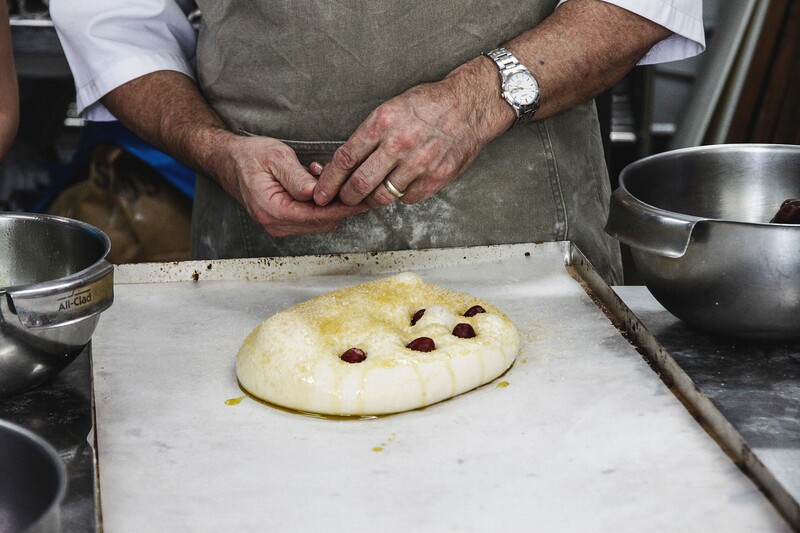 The combination of the dough, olive oil, grapes and raw sugar was mind-blowing. I already can’t wait to reproduce it and adding some fresh rosemary! Schiacciata con l’uva (Foccacia w/ Grapes). Complete this kneading method 4 more times (5 times in total). Shape the dough into a boule (round shape) and place into an oiled bowl, cover with cling wrap and allow to prove until doubled in size (approx 1 hour). ‘Knock back’ the dough by pushing the air bubbles out of the dough, re-shape into a boule and place into an oiled bowl. Cover with cling wrap and allow to prove for 30 mins. Remove dough from bowl, place onto a baking tray and flatten slightly into an oval shape. Push oiled fingers into the dough and push in grapes, drizzle with olive oil and sprinkle with sugar. Allow to prove for 15 minutes in a warm place. Bake at 210*C for 15 minutes until golden brown. It’s quite an ‘achievable’ home bread so I do encourage everyone to have a go. It’s great served alongside some cheese or plain old EVOO or butter. *For Food’s Sake dined at Brasserie Bread independently but attended the baking class as a guest of Brasserie Bread. Prev Big Tree House Cafe, Ryadalmere ‘The Pancake Files’! I freakin love their sourdough pancakes! Schiacciata con l’uva (totally copy/pasted that) sounds amazing! Would you say it’s a sweet or savoury bread? I haven’t made yeasted bread in yonks but this sounds like a good place to start again. It’s kind of both Sam! So so delicious, particularly if you get some of the crusty bit on the end and it’s all caramelised.. I’m going to try it at home in the pizza oven and add rosemary to it. Schiacciata con l’uva looks amazing and I haven’t tried this before. I’ll definitely give a try. It was delicious! You could easily substitute the grapes for olives and throw in some rosemary and some herbs. Such a versatile recipe.